Times of the Islands – Making a Splash! “Race for the Conch” Eco-SeaSwim attracts new and elite swimmers. Training in a swimming pool can get tedious, dreary and lead to burn-out over time, as many competitive swimmers can attest. Recently, many swimmers have discovered open water swim racing as a way to revive the excitement, especially if done in warm waters. Indeed, open water swimming is now one of the fastest growing sports in the world. Swimmers compete in rivers, lakes and oceans without the constraints of pool walls or pool lanes. One look at the beautiful turquoise seas for which the Turks & Caicos are famous makes it clear that their warm, sparkling waters are the ideal location to hold a world-class race. 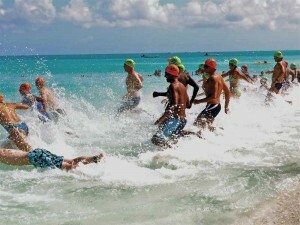 In fact, Saturday, July 7, 2012 will mark the third annual international race in Grace Bay, Providenciales, aptly named “Race for the Conch” Eco-SeaSwim. Planned are 1 mile and 2.4 mile events, plus a 100 meter children’s swim. Start and finish will take place on the beach in front of Flamingo Café, with rules and safety precautions carefully put in place for top level competition, although ALL swimmers are welcome. Chloe and race co-founder Ben Stubenberg met over the phone in November 2009 when Ben sought Chloe’s help to make travel arrangements for a US surgical team going to northern Haiti through Provo. The conversation drifted to swimming when Ben, an enthusiastic open water swimmer who grew up in Hawaii and California, casually asked if there were any races in Grace Bay. 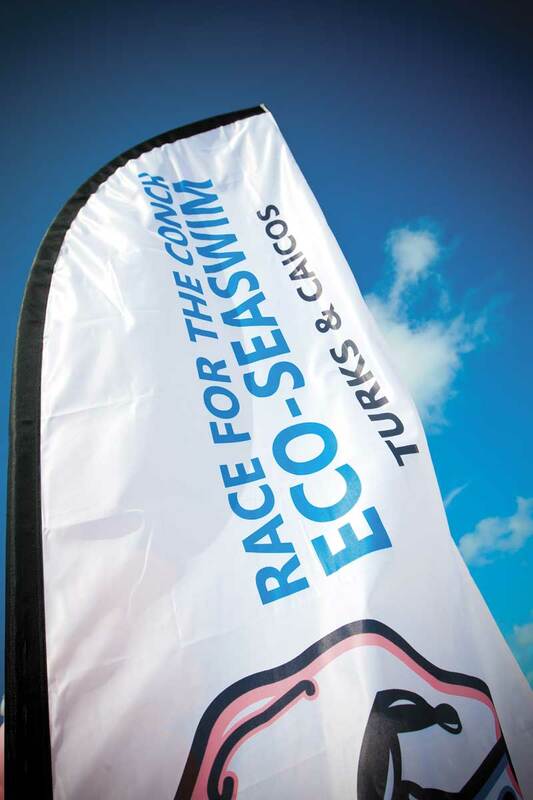 After Chloe told him there were none, they decided to start one, and the Turks & Caicos “Race for the Conch” Eco-SeaSwim was born. They corresponded by email and phone to set up the logistics, open a bank account, promote the race and attract sponsors. “There was a lot of trust,” Chloe recalls, “but it worked.” Chloe and Ben have since started a sports adventure company, Caicu Naniki, that provides open water swim training to pool swimmers who want to get ready for their open water races and triathlons, in addition to other activities. The first year attracted over 75 swimmers; the count was up to 90 by the second year, including a number of international competitors. Chloe and Ben are proud that acclaimed champion swimmer from the Dominican Republic, Marcos Diaz, has competed (and won!) each year, bringing high visibility and credibility to the fledgling event as he raves about the near-perfect conditions. His presence, along with other top swimmers, including champion youth and masters swimmers from the US, Scotland, Trinidad and Italy, challenge participating residents to do their best. Chloe is especially awed by the determination shown by swimmers in the popular 100 meter children’s race. A professional swim clinic by Clay Britt is held before the event (planned for July 6, 2012) to help participants fine-tune their strokes and improve their times. New in 2011 was the Resort Cup, a race in which swimmers from a resort compete with the cumulative time of the top three swimmers determining the winning team. Not only does this promote teamwork and good health during the training process, but also boosts employee morale. Teams from West Bay Club (last year’s winner), Beaches and Club Med plan to participate. “Race for the Conch” brings other benefits to the country. In 2011, the Eco-SeaSwim raised over $4,000 for causes including the Provo Children’s Home, T & C Reef Fund and a special reef preservation project at the Department of Environment and Coastal Resources. Chloe praises the strong support from resident swimmers, the TCI Sports Commission, and the many local sponsors who donate not only funds, but in-kind contributions, ranging from airfare and hotel rooms, to water, snacks, and the medals and t-shirts given to each participant. She credits native artist Stanford Handfield for creating the distinctive conch shell trophies. TCI is a founding member of the West Indies Bluewater Swim Series, which promotes the region as a swim destination, while encouraging swimming proficiency for all West Indians and raising awareness of the need to protect the coral reefs. 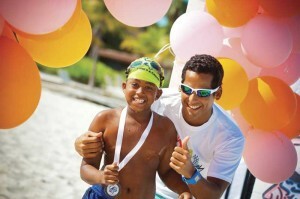 Another key goal is to help the less fortunate through the power and example of swimming. Chloe and Ben agree, “Focusing on a sport builds pride and confidence, and channels energy in a positive way.” They teach swimming at the Provo Children’s Home and saw how getting the hang of swimming correctly really “clicked” with several of the kids. “You could see their self-esteem blossom,” Chloe noted. Whether you prefer to compete with the best or challenge yourself to do your personal best, the “Race for the Conch” is always good fun. Since the course runs parallel to the beach, all spectators have front-row seats to cheer on the swimmers. The times for the 1 mile race range from 20 to 50 minutes, and for the 2.4 mile course from 50 minutes to 1 hour and 40 minutes. The post-race beach party in the evening in front of Flamingo Café traditionally makes up the longest part of the event! For more information, registration and travel/hotel packages, visit ecoseaswim.com or stop by Marco Travel at Graceway House on Providenciales. My family will be visiting your island over the Christmas Holidays from December 24-30 and my son would like to practice with a local competitive age group swim team. My son is 13 and any information you can lend would be great. Hello Dixie, thanks for your inquiry about swim practice for your son while on holiday in Turks and Caicos last week in December. Unfortunately, we do not yet have a proper pool for a swim team so cannot provide practice. However, we do have a private lesson open water swim training program that may be of interest. This is usually a 1.5 hour session (depending on ability) along the shore with a swim trainer swimming along and providing guidance. As it turns out there is another 13 year old boy on holiday with his family who is also a competitor swimmer on a swim team that we will be training during the time frame you are here. It may be possible for both to train together. If this is of interest, I can ask the other boy’s family if this is OK. If not, we can do separate private lessons. Normal cost for a 1.5 hour open water private training is $150 for one person and $90 each if there are two. However, in this case, if training is only be one hour, then it would be less–$90 for one person or $60 if there are two. Let me know what you think. Also, let me know where you will be staying on Provo.